One of the benefits of working with niche brands is the opportunity to develop relationships with these brands’ founders. Case in point: I recently had the opportunity to speak with Stephanie Duttenhaver and Cindy Edwards, the lovely founders of Savannah, Georgia based Sapelo Skin Care. 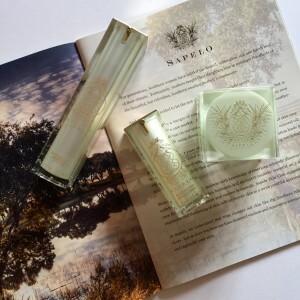 Sapelo Skin Care is Travel Beauty’s latest luxury brand addition. We here at TBHQ instantly fell in love with Sapelo’s unique story and quintessentially Southern heritage: Two Southern women who developed the skin care products they wanted and needed for their own skin, drawing inspiration from the Southern marshes, tides, marine and plant botanicals and the legacy of beautiful Southern women. This isn’t just a genius piece of marketing, though. All Sapelo products are developed, manufactured and filled at a high quality cosmetic laboratory right in Savannah, GA. The impeccable packaging is evocative of a lush Southern garden — these products would make a stunning addition to any vanity or shelf. Most importantly, however, these products WORK. Sapelo merges state-of-the-art breakthroughs in recent research with long passed-down knowledge of native plants to understand the biological mechanisms of healthy skin rejuvenation. This is a 3-step, 28-day recovery system that gently hydrates, nourishes and improves skin quality at the cellular level. You met each other in 2009 while serving as board members of the Savannah Book Festival. How did this meeting lead to Sapelo? CE: I had spent the past twenty years as a “stay-at-home” mom and had a relatively normal life in Savannah. I had been very involved in various community projects, but really wanted to return to a career. Without “real employment” on my resume it proved to be a challenge to reenter the workforce. In 2009 I joined the board of the Savannah Book Festival and met Stephanie Duttenhaver. We hit it off right away. SD: I had been thinking about developing a skin care line for years. Having worked with Cindy for three years to build brand awareness for the nationally acclaimed Savannah Book Festival, I realized in 2012 that I had found my partner. We shook hands sitting in front of the great Pat Conroy and began our own story: Sapelo Skin Care. How did you develop Sapelo’s 3-Step System? Living in coastal Savannah, we drew inspiration for our products from the twice-daily high tides that bring life-sustaining nutrients and water to our environment. Our complete and simple 3 Step regimen mimics the rejuvenating effects of the tides with hydration, stimulation and revitalization of the skin. This regimen contains all the ingredients and molecular compounds needed to hydrate skin and renew collagen, elastin and skin cells. Our Renewing Serum creates a ‘flood tide’ deep into the basement layer of your skin. The serum is infused with gardenia stem cells and hyaluronic acid, the goddess of all humectants. The water-based ‘flood tide’ prepares the way for our star product, the Rejuvenating Cream. The Rejuvenating Cream launches peptides, humectants and micronutrients on the ‘flood tide’. Infused with 5 peptides, the platinum peptide targets inflammation caused by UV damage while the other 4 peptides work to boost collagen, elastin and hyaluronic acid production at the cellular level. The Rejuvenating Cream has all the building blocks needed to build collagen, elastin and skin cells. Being oil based, the ingredients in the cream easily glide through the water channels, created by Step 1, to effortlessly deliver all the goodness needed to build up collagen and elastin. The Softening Emollient is infused with essential oils and stops the evaporation of the dermal saturation of peptides, stem cells, hyaluronic acid and micronutrients that are in Steps 1 and 2. The essential oils also add extra hydration to your skin – you will love how it moisturizes, especially the dry areas around your eyes and brow! Our emollient contains only natural and breathable oils and there are no silicones or ingredients that stop the skin from breathing. How does an eye cream fit into your system? Can any of Sapelo’s products be used on the eye area? CE: I use all three products around my eyes. During development, our cosmetic chemist advised us that it would be all that we would need. There are no retinoids or harsh ingredients that can cause irritation to the sensitive eye area — which is the only reason to have a separate eye cream. Your next product launch will be the Seaweed Cleanser…tell me more! SD: We are so excited! For decades, I have grumbled about cleansers and how they leave my dry skin feeling more dry and tight. Finally, we have developed a very gentle cleanser that contains seaweed and coconut sugar. It leaves your skin feeling fresh, soft and hydrated. The seaweed adds moisture to your skin while the coconut sugar helps to gently lift chemicals, pollutants and makeup. Feedback has been so positive on this product that we cannot wait to bring it to market!